Is Automation the Answer to the Issues Facing the Food and Drink Industry?. September has traditionally been the month where the food and drink industry comes under spotlight. It has been the month for harvesting produce in preparation for the tough winter months. This September this theme continues with the Scottish Food and Drink Fortnight swiftly followed by the British Food and Drink Fortnight. However, today we have the potential of a very different kind of difficult winter to manage, Brexit. There have been many suggestions on how the food and drink industry can prepare for the challenges of Brexit. According to the recent Barclays Food and Drink Report, one of the answers lies in process automation. The result of the Barclays report stated that 52% of businesses are investing in process automation but is the industry right to focus on this area? Business technology advancements happen at such a rapid pace that it is difficult to for most organisations to keep up. In addition to this is the fact that it is all too easy to be driven by the desire to see a speedy or even immediate return upon investments being made. This can lead to investments being made in the wrong areas. From cloud, data analytics and the internet of things to robotics and automation, these are just some of the new technologies that have been released unto the business world in the past decade. Yet many organisations are still using systems and infrastructure that have been operating for 15 years or more. On the flip side of that coin are the businesses that are experiencing growth on a scale that requires them to look at business technology and systems for the first time. Both scenarios can lead to a business investing in technologies that their current setup will be unable to support effectively. At this crucial time for the food and drink industry, it is imperative to make investments in the right areas to enable the benefits of technology to be realised. The manufacture of food and drink is different from other sectors in that there are often many variables and so it makes it more difficult to standardise and automate to the same degree. Fruit and vegetables, meat and dairy production all produce yields that can drastically change. Some examples of what I mean are; the size and health of an animal affect the amount and quality of meat produced and bad weather conditions can cause a reduction in yield in farming and dairy. For a process to be successfully automated, it is much easier to start with a fixed, consistent process. This is where the more pertinent issue arises. This issue is that many food and drink businesses are struggling to record and track the data from their existing process effectively. For automation to work successfully your business systems need to be operating effectively. For example, if your ERP system is misaligned with your operation, the data it collects will be inaccurate. If you then automate a process based upon inaccurate data, you will begin to face potentially complex problems. We all know too well the impact of poorly implemented systems that have cost organisations huge chunks of investment and delivered little to no value, so it is vital that at this current time when businesses are facing into the unknown with Brexit, they don’t attempt to skip this vital area when trying to reap the benefits of automation without ensuring there is a robust system platform to build upon. This is the case when considering making the investment in automation. Although it has the real potential to reduce the typically high cost of labour that the food and drink industry faces as well as reduce production times and increase flexibility, these benefits will So, you can see why businesses are lured into investing into automation as they can see a defined ROI. 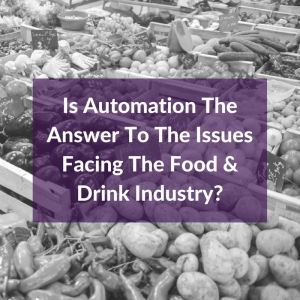 Automation technology does have the potential to play a huge role in helping food and drink manufacturers continue to grow and thrive in a world of unknown economic and political unrest. But in order for that to happen, take the time to make sure your business systems are delivering trustworthy, accurate data first. Once you have data you can rely on, you can identify the right processes for automation, and locate the areas that require the most urgent attention to support a longer-term investment in automation.